Zabbix Server, Proxy and agent all in 4.0.1 version. However I started to have problem with this UserParameter after the upgrade from 3.2.10 to 4.0.1 version last Saturday. 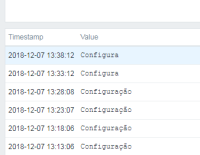 "Configuração de IP do Windows ...."
However in the item Latest data is only "Configura" string. Eveything after the "ç" character is ignored.